Healing Arts Reaching Kids (HARK), a non-profit organization that brings healing and coping techniques through creative experiences to children with illnesses and injuries, is proud to announce the launch of their inaugural Rock for HARK Charity event for Children’s Hospital Los Angeles on Sunday, April 30th at 8 p.m. The benefit concert will feature a one-of-a-kind concert performance by legendary rock group Three Dog Night at the historic Hollywood Roosevelt. Celebrity guests Scout Compton (Nashville), Jane Lynch (Glee), and 10 players from the LA Kings are expected to attend and show their support for Children’s Hospital Los Angeles. While Children’s Hospital Los Angeles is a world-renowned medical facility and Three Dog Night is the iconic, American pop/rock band with hits like “Joy to the World” and “Mama Told Me Not to Come”, it is HARK, the little engine that could, bringing them together for its very first Rock for HARK benefit. Not only does HARK fund arts activities for the young patients and their families, they also provide critical financial support to the hospital’s Expressive Arts Therapy Program through which trained art and music therapists administer proven healing methods to thousands of patients annually. Research demonstrates that these therapies have significant medical benefits, such as decreased stress and anxiety, lowered blood pressure, increased coping skills and self-awareness, minimized pain perception, among other effects. Now in its 10th year, Healing Arts Reaching Kids (HARK) has offered the calming, joy-filled experience of the creative arts to the young patients at the award-winning facility. HARK, an all-volunteer affiliate of Children’s Hospital Los Angeles, provides art supplies, hands-on art workshops, one-on-one art and music play, and other guided activities that foster creativity and allow kids to express themselves. For most of those years, Danny Hutton, founder/lead singer of Three Dog Night, has actively supported his wife’s commitment to HARK and the kids at Children’s Hospital by donating art supplies and volunteering his time at the art shows and fund-raisers. This year Danny decided to help launch Rock for HARK by bringing Three Dog Night’s live performance to The Hollywood Roosevelt and donating a full concert to HARK to benefit Children’s Hospital Los Angeles. Beyond having a great time and raising money for the hospital’s Expressive Arts Therapy Program, HARK also hopes to raise awareness about the importance of these therapies for the young patients. “We hope to help people understand the amount of healing these therapies provide and many people don’t realize that insurance does not cover Art and Music therapy for the kids,” explains Laurie. The Rock for HARK charity event begins at 6:30 pm with the pre-concert party and art sale. 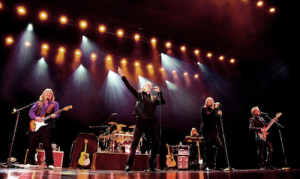 Three Dog Night performance begins at 8 p.m. VIP ticket holders will enjoy reserved seating and access to an after show meet and greet, including photo ops, with Three Dog Night. Benefit Tickets are $150 per person; VIP Tickets are $250 and are available through the HARK website:www.healingartsreachingkids.org on now. HealingArts Reaching Kids missions is to bring healing and coping techniques through creative experiences that allow children to express their fears and triumphs that may be a part of their illness or injury. The organization hopes to bring the much-needed supplies, as well as, hands on art, music, poetry, and creative writing opportunities to critically ill and injured children at Children’s Hospital Los Angeles. HARK’s goal is to provide a hospital-wide environment splashed with color, poetry and music, from children’s art and poetry displayed in the lobby to the sounds of music from patient rooms.